If we assume for a moment that we have the best current sensor technology available to us, what size sensor do we put it in our cameras? Curiously, that’s a problem that the camera makers are starting to have. First, a reminder: CX, m4/3, DX, and FX are all each theoretically “one stop apart.” Yeah, the equivalence thing again (see for example Pick a Size on sansmirror.com). That’s assuming, of course, that I want to take the exact same picture from the exact same place. There’s also price. The sensor is still the most expensive part in most cameras (though not so much in compact cameras). We can simply create more sensors on the same wafer with higher yields and perhaps create them faster—FX sensors tend to take multiple passes to create on the stepper—so we get very high price reductions with smaller sensors compared to larger ones. Theoretically (there’s that word again) the camera makers would love to keep using really small sensors in compact cameras: it reduces cost. But smartphone image quality pushed upwards so fast and coupled that with convenience in ways that make sticking with the digital compact camera ideas of the past essentially suicidal. Even that “huge lens on compact sensor” idea that the camera makers keep saying is growing? Nope. The actual numbers tell us that those models are holding steady in sales and the “growth” is in percentage of compact cameras sold ;~). So what we’ve seen lately is that camera makers “climb the ladder” in order to set camera image quality off from the phone crowd. We went from 1/2.7” to 1/1.8” to 2/3” and now we’re seeing the use of 1” sensors in compact cameras (some of which, like the Nikon 1, have interchangeable lenses). Sony’s apparently about to up the ante and join the 4/3" crowd with the RX, another climb up the ladder. Meanwhile, Nikon has been pressing their existing DX DSLR customers to join the FX club, another ladder climbing experience. I see people quibbling over fractional gains in dynamic range and noise floors and a whole host of other measurements on sensors, but let’s ask a more basic question: can you really see the difference between an image taken with a Sony RX100 and a Sony A7 in daylight scenes? Theoretically (again that dang word) the A7 image should be three stops better and you should be able to attain three stops narrower depth of field if you want it (assuming equivalent lenses). More and more my answer has been “yes, but not enough difference to be important to me.” Which is why I carry an RX100 or LX100 around with me most of the time and not an A7 or the big gun DSLR. Okay, so low light can be an issue. Three stops in low light is visible to most people in terms of image quality. This would be solvable if the camera companies actually paid a bit of attention to light creation ability. I’ve been nattering about this with the Nikon 1 for some time now: where is the remote commander control over CLS flashes? More light mitigates the small sensor drawback, after all. So why am I so restricted in low light? Heck, I have to take the EVF off my Nikon V3 in order to use even the Nikon 1 small hot shoe flash. Oh, right, the camera companies don’t really want you to buy the low end cameras ;~). Keep climbing the ladder, folks. Canon really wants you to buy a full frame DSLR (6D, 5DIII, 5Dr, 5Ds, 1Dx). No? How about an APS one then (M3, SL1, T6i, T6s, 60D, 70D, 7DII)? No, that’s too much for you? Then how about a G16, G7x, or G1xII? Nikon really wants you to buy an FX DSLR (Df, D610, D750, D810, D4s). If not that, then a DX DSLR (D3300, D5500, D7200, D300s [;~]). Well, okay, still didn’t get you? Then a Nikon 1 then (S2, J5, V3). Did you notice how there are fewer current models in each tier for Nikon? Very telling how organized they are about this. Sony really wants you to buy an A7 model (A7s, A7II, A7r). If not that, then an APS model (A5000, A6000). If not that, then an RX (RX10, RX100). The seven dwarves generally don’t do so well as they just aren’t selling enough cameras to justify such broad and diverse lines. In particular, Pentax is very late to the Up the Ladder game. Olympus is stuck on one rung, while Panasonic has feet on two rungs. Leica, with Panasonic’s help, manages the three tier thing like the Bigs, while Samsung—who shouldn’t need anyone’s help—just barely has a toe on a second rung (NX Mini). So what should you do as a potential customer for a serious camera these days? It’s the bottom and middle of the strategy where Nikon didn’t get execution correct. I’ve outlined before that DX just feels like Nikon is mindlessly iterating three bodies and forgetting “the system” (which includes lenses). I believe they think DX too much as a transition to something else and not enough as a possible final platform for someone. After all, you’re only giving up one stop, but you’re getting a substantive price break for giving that up. Still, at least Nikon continued iterating the primary bodies. The D5500 and D7200 probably are more than enough camera for a very large proportion of the semi-serious to serious photography population. At the bottom, the Nikon 1 is a head scratcher. Even though I’ve complained about usability and discovery issues with the Nikon 1 cameras, that really wasn’t the thing that doomed them. Price doomed them first. And when you gulped at the price, the usability issues became deal breakers. It’s interesting that the J5 appears to be back to a pretty standard camera UI again. It looks like a camera, it operates like a camera, and for the first time, it was introduced at a price that puts it near the bottom of Nikon’s ILC lineup (same price as the D3300, though it really should be below that to be rationalized). I predict that we’re now on this four-stop ladder for as long as Bayer-type sensors are the best choice for serious cameras. Moreover, I predict that lower rungs will have a tendency to disappear over time as smartphones continue to push upwards. What that means is that a 1” camera purchase is probably a shorter term choice, while an FX camera purchase is a long-term choice. Again, the FX side of things is the part Nikon got (mostly) right. I believe they were too worried about undermining themselves, though. They haven’t pushed DX as much and as far as they should have, and ditto CX. The ladder is always being climbed by the customer. They’ll get to FX someday (or they never needed it in the first place). Hook them with CX. Migrate them to DX. Finally give them a shove upwards to FX. Instead, Nikon seems to want to capture as many FX customers as possible, even if that means losing customers below. 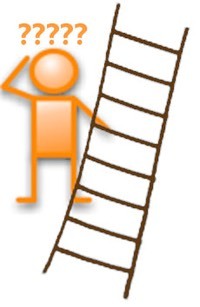 So where are you on the ladder and why? Do you really need every stop possible, or do you need convenience? (That last includes size/weight.) I’ve moved about half my shooting to the latter, while client and my high end projects still stay in the former. I’d be a perfect candidate for a perfect CX/FX set of gear, but instead I’ve opted more towards m4/3 and FX.